Italian house Costume National will launch Cyber Garden in October. This project was inspired by a futuristic vision, an imaginary scene of what a garden would look like far beyond our present time. The essence is the result of a magical trip to the future where, like in a time machine, a sort of shuttle leads to a science fiction garden and abducts all its smells. Cyber Garden was developed by perfumer Antoine Lie, and is described as a fresh green scent with three accords: Green Ether, Vynil Accord and Hybrid Moss. 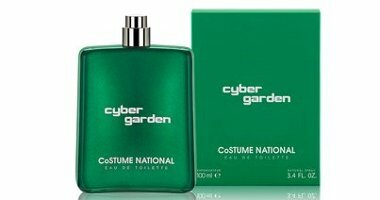 Costume National Cyber Garden will be available in 50 and 100 ml Eau de Toilette. That looks sarky but I am genuinely excited to read this. Fingers crossed it’s freaky as it reads. Though I don’t expect it to be really. I like Costume National…keeping my fingers crossed. But actually now I can’t remember if I even tried their last one, oops. Weirdly I am getting a completely retro-futuristic vibe from the bottle and copy. Logan’s Run meets the original version of The Time Machine? From the copy, yeah. Not sure what that bottle says…think it could be better. Could this be what I had hoped CDG Amazing Green would be?